What inspired you to start quilting? Was it your grandmother, or maybe your mom, humming away on her old Singer sewing machine? Or maybe you sat under a quilting frame fascinated by the needle going up and down. For me, sewing and then quilting, were things I just had to do. You see, I'm a person who has to make things. I've been making things since my first little bake kitchen. Even since I had a piece of paper to draw on. Even since the first Christmas tree made from a reader's digest magazine, painted green and sprinkled with glitter. Even since my first needle took a stitch into a piece of fabric for a doll dress. I don't have many needleworkers in my family. My mother does not sew nor did my grandmothers. I have learned recently that one great grandmother collected old cloths to 'fix up' (so that's where my fabric collecting comes from!). My other great grandmother was a maker of things. She made doll clothes for my Barbies dolls and she crocheted afghans by the dozens. I, like many of you, learned to sew in high school. I hear so many stories of strict teachers, but mine was not, or at least I did not notice. I had found my thing and nothing could stand in my way! I loved to sew. I made all kinds of clothes; I even wore many of them. My mom tells me I would just try again if it did not work out. It never seemed to bother me that a project was not totally perfect, a trait I have to this day. Over the years I continued to sew clothes--with a wedding dress, a few curtains and pillows thrown in. My first quilt came to be when I need a bedspread for my bed. This was in 1978. I knew how to sew, so I decided that I could make a quilt. I bought a quilting magazine (which I still have), some fabric, a large flat sheet and batting. I made a big single Lemoyne star that covered the whole top of a double bed. Then I put in some yarn ties about every 3 feet or so…which seemed to be plenty! In 1992 my quilt friend Gwyn decided I should learn to quilt. I was not sure, I'm so impatient and it looked like it was lots of work. Well she would not take 'no' for an answer and off to the quilt shop we went. She signed me up (mind you, she already knew how to quilt and was not taking this with me). Well, a nine block sampler later and I was hooked! Since that time I have only worked with fabric, and almost all my time is spent on quilts, I'm so lucky! After a few years of quilting, I taught some classes and enjoyed that too. I also made quilts to sell and did commission quilt pieces. I made small quilts for the Kona Bay fabric company to use in their booth during trade shows. I even had a short lived mail order catalog that sold patterns and books. On December 1, 1997 I decided I should figure out what to do when I grew up, because I knew it was not what I had been doing for 20 years! I quit my career in computers and took some time off. About two weeks later…(remember I said I'm very impatient) I had designed a quilt pattern and found my new career! I really enjoy designing patterns and seeing how other quilters make them their own. No two quilts are ever the same. I've been working in a folk art appliqué style for the past five years. I find that it is the most enjoyable and relaxing way for me to quilt. I'm the type of person that likes things crooked, asymmetrical and little off beat! I don't do a lot of piecing anymore, but I do love to piece the backgrounds of my appliqué blocks. (I also piece the backs, but that's another story!). When I design patterns I usually have a theme or an idea that gets it started. Sometimes a fabric will even inspire the design. My pattern 'Cottage Rose' got started with a traditional block that I loved. I then drafted it larger and added corner stones and appliqué. I also made the quilt in two different colors and they look so different! Flowers were the theme when I designed 'Ma-Ma's Garden'. I wanted to give the feel of my great grandmother's gardens. Using lots of big folk flowers gives this quilt the feel of an old fashioned garden. For 'Be Thankful', the phrase itself started the quilt idea. I love sayings and quotes. 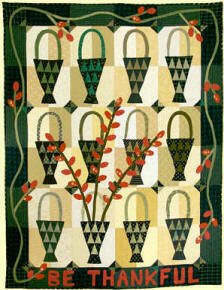 The idea of a bouquet of flower buds in a basket got the quilt design moving along. It ended up with nine rectangle basket blocks and a neat setting arrangement. I design and make quilts for a living, which is pretty wonderful job! I publish my own designs and have had many quilt designs published by others and in quilt magazines. I think my great grandmothers would be proud that some of their sewing traits have continued.